Well, no, not any kind of business like the KidZania play spot in Japan that I've posted much about, but perhaps even better: Grandma and Grandpa's place in Ohio. Anthony generally spends the summer at my folks' place in rural Ohio, both to bolster his English ability, and, well, to be able to see Grandma and Grandpa. They live in the countryside, so it's always a great experience for him. We arrived yesterday evening. Our luggage arrived this morning. It didn't take long before he was playing outside, power-washing some heavy machinery. 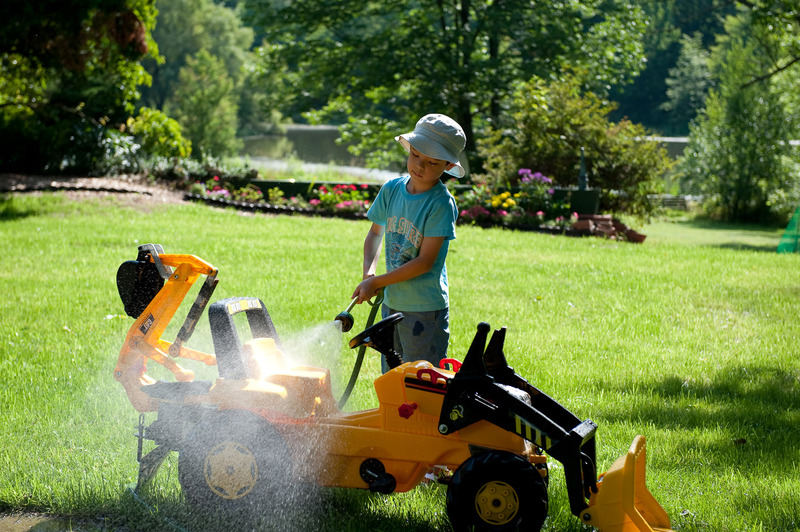 The toy backhoe has been a recurrent theme during our summers: 2006 · 2007 · 2008. Grandma and Grandpa have a new big sandpile, and so of course he wanted to play right away, but had to wash off the backhoe first. “Washing the backhoe” quickly became “playing with the hose”, and much fun ensued. Reid here. I’m the one that came up with the quote on your website about thinking that Lightroom will be to photographers what Photoshop is to photographs. I was some of your low light D700 shots am I’m following in your footsteps upgrading from the D200. I never wanted to shoot it past 800, but I hear the D700 is a different story. I saw a post of some rodeo shot at ISO 10,000 that were really clean. If you have any thoughts or recommendations about things that would be good to know about the D700, please let me know. Oh and were is the official flash card list for the D700? I’m looking to get a Ridata card which I’ve used before. Time goes by so fast! I wonder how tall is anthony’s tree …I love the picture when he is planting it. I would like to see Anthony next to his tree . Just curious, is it anywhere near Ada? My son is now at ONU for a Jamap-US camp.